This is a basic composition that shows how to construct a sphere shape by using GL Lines (GL Tools patch required), Iteration, Interpolation, and LFO's. 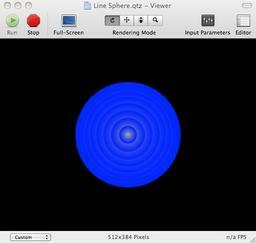 By using GL Lines, one has control over many interesting Stipple Patterns, and color control, that aren't available with a stock Sphere, while it has other limitations compared to the stock Sphere (no ability to texture the whole shape, only the lines which comprise the constructed Sphere). This reminds me of those threads on the forum about making circles in QC :-). It's amazing what regular and irregular shapes can be made with the GL Line. All three compositions , Spirograph, Sphere & Cone make for great study examples. I do have many more shapes and concepts constructed with lines, other renders and iterators, that compliment this set. Hopefully I'll get a chance to tidy them up and post soon, as well as write/record some in depth explanations instead of just letting the qtz's speak for themselves. Greate George! Just wanna say, if your interpolation on y rotation is 180 degrees instead 360, it will be shown all iters you have. I hope soon I will catch up all your posts to be uptaded! I have been busy and this week to LPM festival.